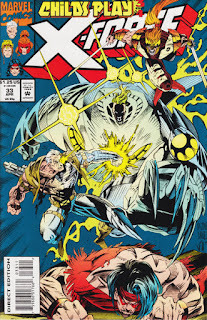 "Child's Play Third Move: Rules Were Made To Be Broken"
Outside the Guthrie home, X-Force battles Fitzroy, tricking him into using his own life force to open a portal to the last place he's been. 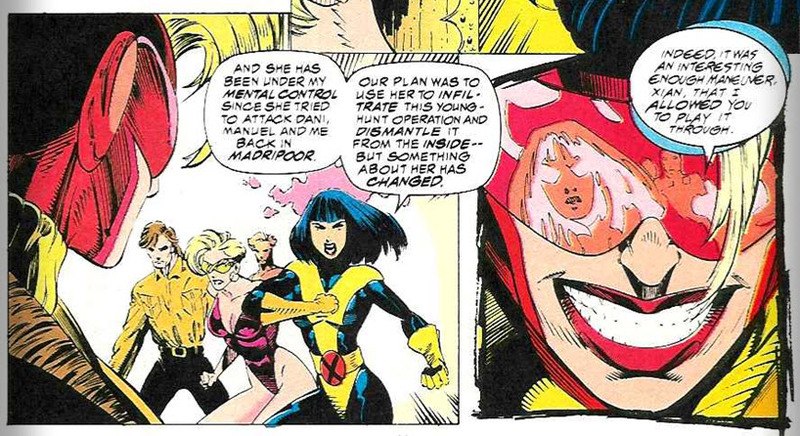 As X-Force jumps through, Cannonball's sister Paige follows them, over her mother's objections. 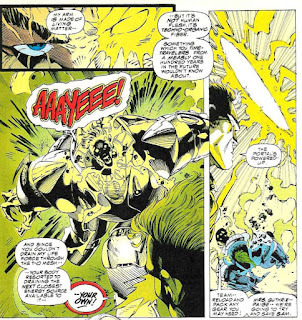 Meanwhile, Justice delivers Firestar to Gamesmaster, who tells him he is well aware of Shinobi Shaw's plans to usurp him, that he knows Justice intends, in turn, to betray Shinobi, and that all the mutants captured in the Younghunt thus far are now connected to Gamesmaster, so to kill him would also kill them. 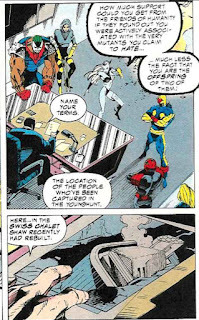 In New York, the New Warriors blackmail Graydon Creed into telling them the Gamesmaster is at Shinobi's Swiss chalet, while X-Force arrives at Shinobi's penthouse and forces him to do the same. At the chalet, Karma wakes up and frees the captive mutants, revealing that she's been in control of Siena Blaze since Blaze attacked her in Madripoor. However, the Gamesmaster in turn reveals he's well aware of that, and takes control of Blaze himself, using her power to blast everyone into unconsciousness, declaring he'll use their powers against those coming to rescue them. 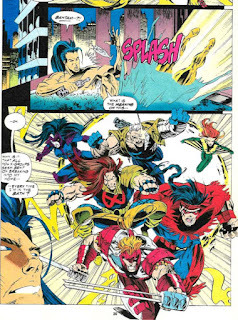 Part Three of "Child's Play, this issue finds X-Force battling Fitzroy before converging (along with the New Warriors) on the Gamesmaster and his captives. It also reveals that Karma took control of Siena Blaze in New Warriors #45, though that advantage turns out to be short-lived. Cannonball & Karma enjoy a brief reunion, interacting for the first time since Karma left the New Mutants (to focus on finding her missing siblings, eventually ending up working for her criminal uncle and appearing in Wolverine) back in New Mutants #54. 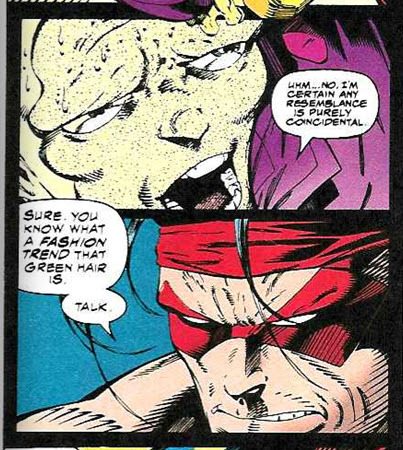 As X-Force leaves Shinobi Shaw, he notes a bug flying around his head; this will turn out to be Paige, having adopted that form to secretly follow along with X-Force, though once again, that level of physical transformation is somewhat incongruous relative to how she is later shown to use her power in Generation X. Though draining his own life force to power one of his portals would seem to suggest Fitzroy is dead, he's not, but despite being introduced as one of the preeminent new villains following the linewide relaunch in 1991, and making semi-regular appearances over the last couple of years, it will be a little while before he pops up again (during the second year of X-Man), and this issue effectively marks the end of his association with the Upstarts (which will themselves be more or less ended in the final chapter of this story). 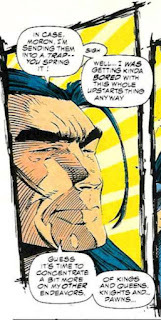 Similarly, Shinobi Shaw essentially gives up on his machinations involving the Upstarts and Gamesmaster in this issue, declaring it's time to focus on other endeavors (presumably his resurrection of the Inner Circle of the Hellfire Club, as mentioned in X-Men #29), though he will appear again sooner and with slightly more frequency than Fitzroy. 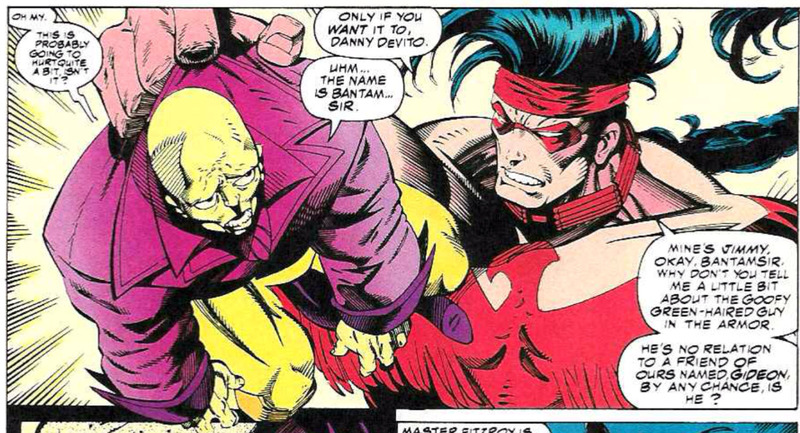 There's a mildly humorous running gag in this issue in which X-Force refers to Fitzroy's toady Bantam as "Bantamsir", because when they asked him his name, he responded, "Bantam, sir". 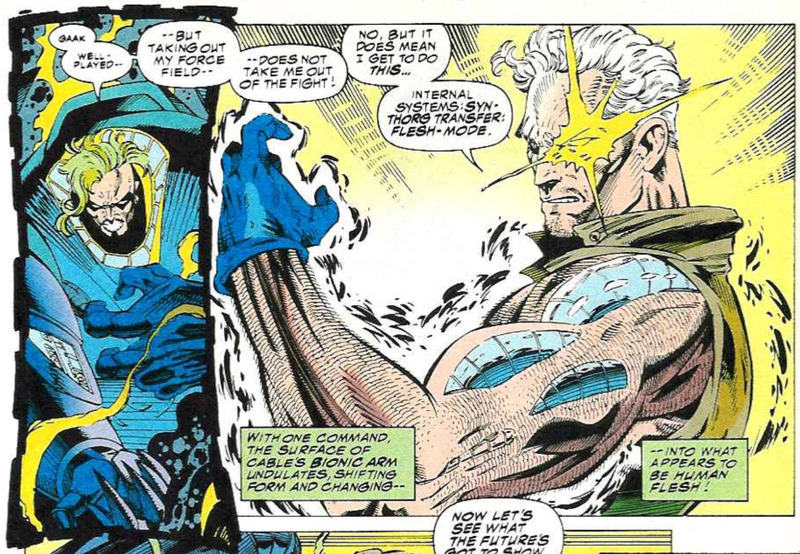 When Fitzroy tries to drain Cable's life force via his techno-organic arm, it backfires, causing Fitzroy to drain his own energy. The logic of which seems dicey (you'd think it would just shut his power off), but whatever. The Gamesmaster is operating out the Swiss chalet Shinobi Shaw had rebuilt over his father's, which he destroyed in his first appearance in X-Factor #67. 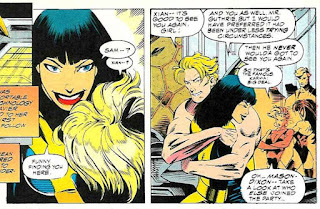 Shaw also comments on the fact that people keep seeming to drop in on him whenever he's in the tub (a reference to Uncanny X-Men #282 and X-Men #23). 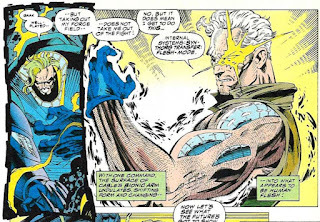 Cable apparently now has the ability to apply and retract artificial skin over his techno-organic arm. The fact that both Fitzroy and Gideon have green hair is mentioned, though it's (seemingly) just played as commentary on the fact that two unrelated 90s villains have green hair for no good reason, rather than an implication that they are somehow related. We're also reminded that New Warrior Namorita is now going by the name Kymaera, because the 90s. For the penultimate chapter of "Child's Play", Nicieza continues to somewhat surprisingly keep things small. 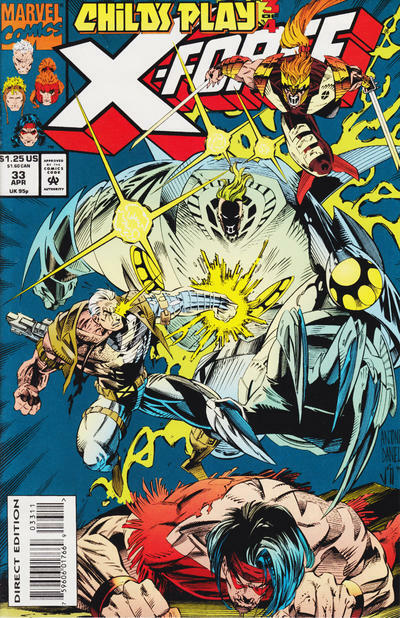 The storyline concludes in the next chapter, and Nicieza gets all the players in place for the finale, with both teams set to converge on Gamesmaster's base of operations, yet as of this issue, X-Force has only directly faced off against one Upstart (Fitzroy), and has yet to actually cross over and interact with the characters starring in the other series participating in the crossover. That's not necessarily a bad thing - in fact, the relatively limited scope of this crossover, especially at this point in the 90s, is rather refreshing. Yet it is nevertheless odd to have a crossover in 1994 that is this restrained, especially when it is a crossover between New Warriors & X-Force, two of the more "stereotypically 90s" series out there. Tomorrow, Nightcrawler despairs in Excalibur #76. Next week, the wedding-centric What If? #60. This is an issue I had fond memories of as a kid, I'm pretty sure it was my first issue of X-Force. It was crazy to me as someone who only knew the X-Men how there were all these mutant characters with all this history, but there were no appearances by any X-Men. Speaking of which, what's the deal with Karma constantly being written out of books she's in? Is she that hard of a character to write? Or if she just not that good of a character? "Speaking of which, what's the deal with Karma constantly being written out of books she's in? Is she that hard of a character to write? Or if she just not that good of a character?" Huh. That's a good question. My take is that Karma doesn't have much going for her personality-wise. She's just kind of... there. She has her tragic backstory & the hook of her taking care of her siblings, but those are plot threads, not personality ones. But again, that's my take. 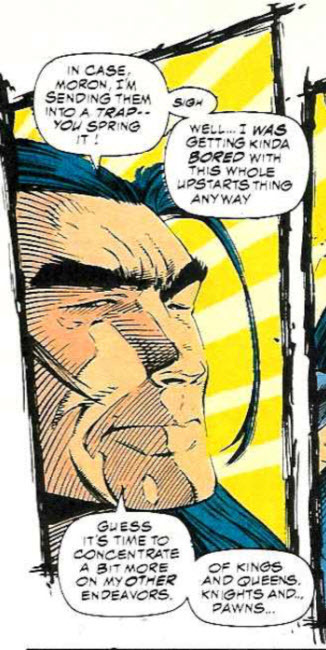 I don't know, I always found Karma was one of the more interesting New Mutants, of course from my limited exposure point of view (MTU #100, UXM ANNUAL #10 with Mojo, NEW MUTANTS SPECIAL EDITION in Asgard). From the creative combined use of powers point of view she should be a magnificent character to have, as she can temporarily take over whatever villain and bring their power to the pool to be creative of. But I don't know if that makes her a bit of Sersi-like overkill to write, because she can easily incapacitate most villains to be beaten down, which would then need to be counted by a flailing rock taking her down first as a fight starts or something. Yeah, I think the problem with Karma is a combination of a fairly non-existent personality combined with a power that's either too powerful (like Teemu said, she can just mind-control every villain they face), to the point where she's a pain to write, or too low-powered that she's a pain to write (if she can't take control of the villain's mind, what even the point of her, then?). Neither of which are insurmountable issues (give her a personality, establish a reasonable limit/scope to her powers), but it becomes this self-perpetuating thing where no writer wants to tackle the character because she's never around enough to develop a following such that anyone cares enough to tackle the character, and as a result, she remains uninteresting so no one wants to tackle the character, etc. Point taken re the problem of writing around Karma’s powers, but I think she did have a personality when New Mutants started up. At least inasmuch as any of them did. Xi’an was the oldest and if not the most socially conservative of the bunch then, by dint of personality or societal background or both, socially conservative in a slightly different way than Sam and Rahne — qualities that combined to make her the big sister of the group. While her actual younger siblings being out there in need of her help made it easy to write her out of the books I was sorry to see her all but forgotten when there was definitely a place for her as a bridge between Xavier and her teammates in terms of responsibility per her seniority and temperament, although granted that may not have played so well in the days of Magneto or Cable taking charge. Xi’an and Kitty were sort-of flip sides of a coin, each being more age-appropriate to the other group save for training. Fun fact: I got put in touch with the young woman made up as Kymaera for New Warriors #44’s photo cover around the time it came out. She lived in Philly so she came downtown to the main location of Fat Jack’s Comicrypt, autographed some copies, sat for a few photos, and did a fun little interview for an article that with her blessing was titled “Bitchin’ Kymaera” (which, trust me, was a commendable pun for my generation 20+ years ago; look up The Dead Milkmen). I actually have the piece ready to post online for posterity whenever I finally get my site rolling again.